If you are looking for a housewarming gift or gift for someone who is into healthy living and healthy cooking, then get the multi tier vegetable steamer cooker for healthier cooking of vegetables and food. Steaming involves no cooking oil unlike frying. Food is cooked using the hot steam. Vegetables retain more nutrients when steamed compared to other cooking methods. Food cook in their own juices. Portable electric countertop food steamer for vegetables, meat, fish and poultry make steaming food hassle-free. Besides with steaming, there is less mess to clean up. The 3 tier stainless steel electric food steamer is one such portable countertop food steamer for home use. The food steamer cooker results in vegetables which remain green after cooking. It makes steaming easy and hassle-free. You can steam rice, fish, chicken, hot dog, eggs, meat, corn etc and it is also great for reheating cold food. Yes, you can cook your whole dinner in it. For steaming rice, you have to add 0.5″ of water or broth to the rice in the basket. If you’re using a 2 or 3 tier food steamer, you can steam more than 1 type of food at the same time. The food with the longest steaming time should be added to the bottom basket. The top basket should be for food that cook the fastest. Electric food steamers come with timer and auto shut-off when cooking is completed or when the steaming water is empty. These safety features make the electric food steamer simple, easy and safe to use. The electric food steamer frees up your gas stove for your other cooking needs. With the 3 tiered vegetable steamer, it is now easy to eat your 3 – 4 portions of different vegetables daily. With the Secura 3 tier steam cooker, you have a choice of the 6 quarts capacity or the large 9 quarts capacity food steamer. The entire package includes a steamer base, 3 steam basket sets, see through lid and heater cap. It has a 60 minutes timer with indicator light. This 3 tier 6 quarts Secura electric food and vegetable steamer has removable stainless steel steam baskets in which you can serve your steamed food. These are 8″ diameter and 2.375″ in height with each basket holding 2 quarts of food. Put in hot or cold tap water in the base pan and steam will be generated in less than 15 seconds. The water reservoir holds enough water for at least 60 minutes of cooking time. It will shut off automatically if water level gets too low. It is possible to cook different types of food in the 3 steamer baskets without worrying about the mixing of flavors. This is possible due to the Steam360 technology. The baskets come with orifices (tiny holes) around them. These holes let the fresh steam pass through to the next steam basket without having to pass through the food first. Thus it is possible to steam your entire healthy dinner within 30 minutes. The food steamer cooker comes with a limited 1 year manufacturer’s warranty against defects in materials and workmanship under normal use. 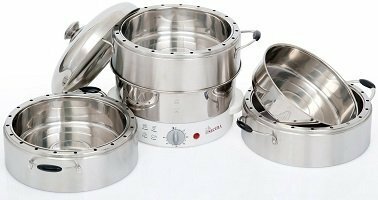 The Secura 3-Tier 6-Quart stainless steel electric food steamer with steam 360 technology S-324 would make a wonderful housewarming gift or as birthday gifts, Christmas gifts.